CAPE CANAVERAL, Florida (AP) ― Spacewalking astronauts easily replaced a dead computer outside the International Space Station on Wednesday and got their orbiting home back up to full strength. The two Americans on board, Rick Mastracchio and Steven Swanson, hustled through the urgent repair job, swapping out the computers well within an hour. The new one tested fine. “Excellent work, gentlemen,” Mission Control radioed. The removed computer, a critical backup, failed nearly two weeks ago. The prime computer has been working perfectly, but NASA wanted to install a fresh spare as soon as possible. Mission Control waited until after the arrival of a capsule full of fresh supplies Sunday. Replacing the computer ― a compact box ― involved just three bolts, hardly anything for a spacewalking chore. Engineers do not know why the original failed. Mission Control asked the spacewalkers to keep an eye out for any damage that might explain the breakdown. Nothing jumped out. Flight controllers were trying to load software into the spare computer on April 11, but it failed to activate. That set into motion a frenzy of ground meetings and tests to fix the problem. NASA feared that if the primary computer went down as well, the entire space station would be in jeopardy. These two computers ― the primary and backup ― control the pointing of the solar wings and radiators, as well as the movement of the robot-arm rail cart. It was the first failure of one of dozens of so-called MDMs, or multiplexer-demultiplexers, in and outside the space station. Mission Control kept the spacewalk short and straight-to-the-point; it lasted a mere one hour and 36 minutes. 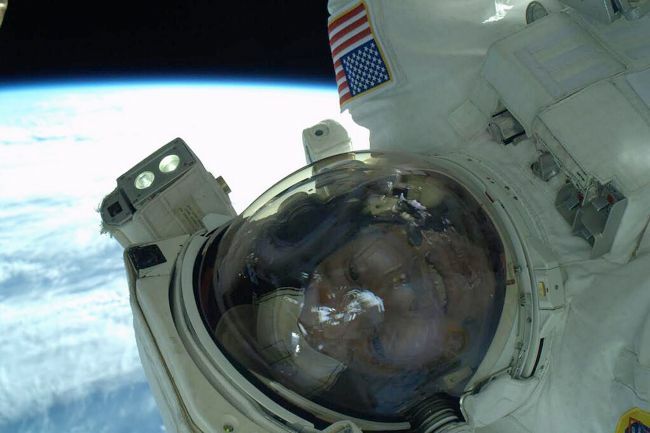 All routine spacewalks by U.S. station crew have been on hold since last summer’s near-drowning by a spacewalking astronaut. His helmet filled with water from the cooling system of the suit, and NASA is continuing to investigate the problem. NASA hopes to reuse the bad computer, once it’s inspected indoors by the astronauts and updated. Their mission accomplished, Mastracchio and Swanson exchanged a few jokes and laughs as they got ready to go back inside. “My arms are too short for a selfie,” Mastracchio said with a chuckle, his camera pointed at himself. Mission Control spotted a small object floating over Mastracchio’s right shoulder as the spacewalk drew to a close. He said he didn’t think he lost anything. The NASA commentator, Dan Huot, later said it appeared to be a tiny wire tie.